Two turns after Wanda’d had her head worked over by Betsy and Charlie, she was able to ride. So Jillian packed up their rations and led her slowly through the city on horseback, on up the ramp to the outer walls on the northwest side, and into the shade of a huge cylindrical cistern. “You got your appetite back yet?” she asked Wanda again, helping her down to the stone walkway. Physically, she seemed a lot less frail. But that wasn’t difficult. Jillian unpacked the bento boxes and canteens, and threw a horse blanket down on the damp stone. 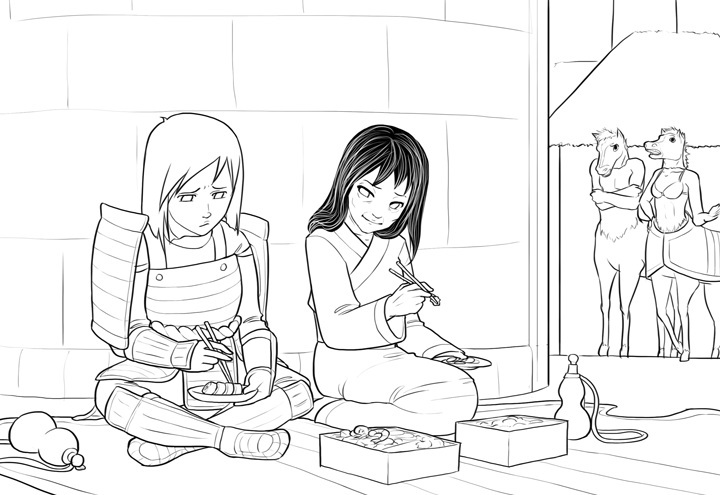 They munched on crisp vegetables and little fish rolls, looking down at the sunlit city of emerald. Wanda ate daintily, but she did seem to be making a dent in her box. “You gonna miss this place?” Jillian asked. “Thank you,” said Wanda. She nibbled on a pickled carrot. “You said you would sign,” said Wanda, turning to look at her. “I do,” said Jillian, bitterly. There’d been dark hours at night when she was certain she’d be calling out for the Archons at any moment, and bargaining for buds. Whatever Charlie wanted. Only the thought of the flower as an enemy got her through. That, and having to look at Chynna and admit her weakness. In those thin, watery moments of will, she generally got up and did calisthenic exercises until she dropped from exhaustion. That worked in the moment, but the need never went away. Force the issue. There was an enemy in the form of a little pink flower. Charlescomm was popping that “unit” in quantity. She spent a few minutes in thought. A breeze blew through, not carrying bud-scent but some ordinary kinds of flower. She could see some of their new mounts down in the street below. Bright patchwork tents stippled the far horizon. It was nice here, in the shade, seeing Wanda looking better. The Lady Firebaugh seemed intent on finishing her meal, despite the tiny bites she was taking. Jillian had made this happen, and that felt pretty good. All it took was a little stubbornness in negotiation. She had something Charlie wanted, badly. It had only required holding out for what she wanted in return. The Chief stood up. She put her fingers in her mouth, and tore out a whistle through her teeth. The high horses skittered and bucked, even the ones down below.